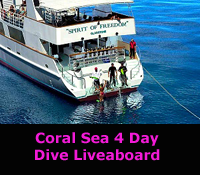 The best scuba diving that Australia has to offer is to dive the Coral Sea on an Australia liveaboard dive trip cruise on Spirit of Freedom. 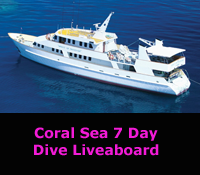 The experienced and professional crew members have extensive knowledge of the Coral Sea from years of practical dive cruise experience. 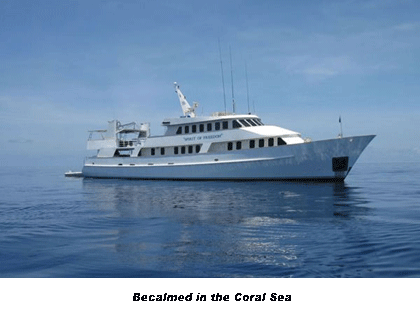 Beautifully appointed, elegant and spacious, Spirit of Freedom offers the full range of scuba diving options that you would expect from a classic liveaboard dive boat rated as the pinnacle of australian diving boats. 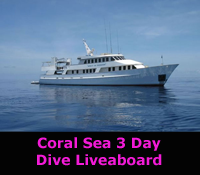 The Cod Hole is also included in the itinerary when you dive the Coral Sea on this dive liveaboard. When you dive the Cod Hole you will see giant Potato Cod (Groper) and equally massive Maori Wrasse in their natural habitat. You should book this cruise well in advance to avoid disappointment especially if you require premium cabins. Also available is the Cairns 3 day 2 night cruise which departs from Cairns everyday except Tuesday for scuba diving on the Great Barrier Reef and Continental shelf off Cairns. 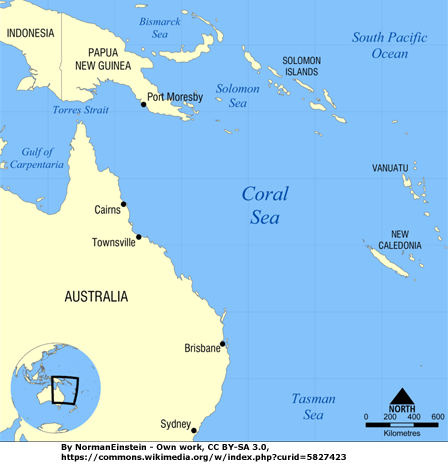 The Coral Sea is classified as an interim Australian bioregion. It is a marginal sea of the South Pacific and is located off the northeast coast of Australia. The sea extends from the east coast of Queensland, Australia which includes the Great Barrier Reef and Arafura Sea and as far east as Vanuatu - (formerly known as the New Hebrides) in the Pacific Ocean. It includes the Gulf of Papua and merges with the Tasman sea in the south. The sea exhibits a warm and stable climate, with typical torrential rains in the wet season (January to April). It contains numerous islands, reefs and cays as well as the world's largest reef system, the Great Barrier Reef (GBR), which was declared a World Heritage Site by UNESCO in 1981. All previous oil exploration projects were terminated at the GBR in 1975, and fishing is restricted in many areas. The reefs and islands of the Coral Sea abound with a huge diversity of birds and aquatic life and are a popular tourist destination, both nationally and internationally.